Do you celebrate Easter (aka Resurrection Sunday)? If so, do you believe the holiday is about more than just Easter egg hunts and bunnies? If so, do you enjoy reading short stories? If you answered yes to all of these questions, then you might enjoy a new anthology of short stories that were chosen for their spiritual value. 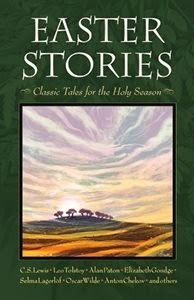 Easter Stories includes favorite short stories from world-famous storytellers such as C.S. Lewis, Leo Tolstoy, Selma Lagerlof, Oscar Wilde, Elizabeth Goudge, Maxim Gorky, Ruth Sawyer, Anton Chekhov, and Walter Wangerin – as well as many you’ve probably never heard before. As Easter approaches, I have been reading these stories out loud to my kids. Each of the stories has a hidden meaning, or a moral to it, and one of our favorites is "The Ragman" by Walter Wangerin, Jr. - a timeless classic about a man (symbolic of Jesus) who took away old rags and gave new ones in return. We understood this story and enjoyed reading it, but there are others we didn't quite understand. With that in mind, I think the book could benefit from having a section that actually explains what each of the stories means. If you would like to add this book to your library, enter the form below for your chance to win one. It will be directly sent to the winner by FlyBy Promotions. Giveaway ends Saturday, March 21, 2015, at 8:00 p.m. CST.